When early cars spluttered across the earth they were ‘Gentlemans Carriages’, hand built and extremely expensive. They were so costly and labour so cheap that it didn’t matter that the paint took weeks to complete. Hand painted by brush in the style used on furniture, it was called “Japanning’ with Lacquer, but the western equivalent was actually more like a shellac varnish that was not completely opaque, so it took many (many) coats and each had to air dry then be flatted and another applied to build up the finish. Studabaker for example, quoted 22 stages and 52 days for the whole process. Because the finishes were thick and not particularly durable, the metal, wood and fabric bases expanded and contracted with temperature so the paint would crack, sometimes within months. It was normal to hand brush paint your car every couple of years to keep it tidy. 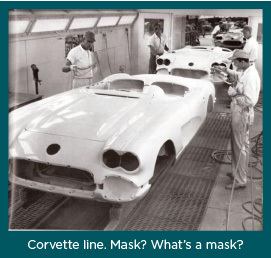 Things were similar well into the 20th Century, though by now the car was priced for the masses, so the paint process started to become an issue both on production speed and cost. Henry Ford was famous for that “Any colour you want as long as its black” statement, but he wasn’t being derisive about consumer choice. Model T’s were originally available in several colours but Ford was obsessed with reducing the cost of his cars so that more people could afford them. The retail price of the T actually came down substantially during its period of manufacture and the reason for the black only limitation from 1914 to 1926 was that he developed an asphalt based enamel which covered quickest and dried fastest (though still taking weeks). Ford experimented with everything, brushing, dipping and even ‘flow painting’, which was sort of hosing a car down with paint. 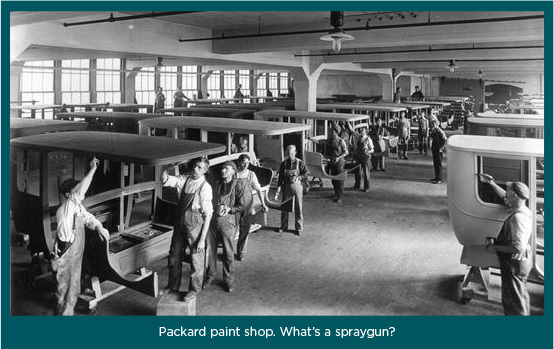 Vast sheds were used for coating and drying and the story is, that due to the heat and to prevent lint falling on the sticky enamel, the painters went about their work naked. General Motors and Dupont developed Pyroxylin, a hard wearing enamel available in many colours and eventually Ford had to do likewise and offer limited colours. Even then, to keep the price down on Ford Model A trucks, the paint wasn’t polished but left in its matt state, though you could have it flatted and polished as an option, for about $22. Something new was needed and the story goes that on a Friday afternoon in July 1921, a worker at the DuPont factory left a barrel on the loading bay. It contained Gun Cotton, which was cotton soaked in a mixture of Nitric and Sulphuric acid to form Nitrocellulose, an explosive and also somewhat bizarrely, the basis of ciné film until superseded by ‘Safety Film’. The latter didn’t have the tendency to go up in flames and burn down cinemas, a considerable advantage for something that ran past an incredibly bright and hot electrical filament. That weekend was particularly hot and that barrel of explosive baked in the sun. When the workers returned on Monday morning they were shocked to find it and threw a cordon around the barrel, evacuated the building and called the hazmat team…except they didn’t, because these were different times. They rolled the barrel into the warehouse and took off the lid to see what condition the explosive was in. Inside was no longer gun cotton, but a clear, thick liquid and the DuPont chemists were set to work finding out what it was and how it could be exploited. 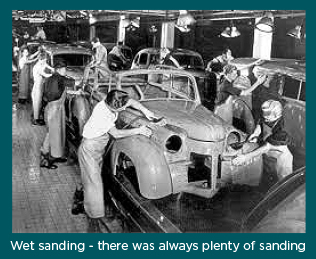 A couple of years later the first cars were painted with the new Cellulose paint using the new fangled Spraygun and the painting element of vehicle manufacture went from weeks to a day. Its only disadvantage seemed to be that it was damaged by petrol. After the War there were restrictions on Germany producing any explosive compounds as history had shown this caused all sorts of problems. It meant Nitrocellulose was out of bounds, so the mighty German chemical companies turned to other bases and developed alkyd resins. These enamels had a higher concentration of pigment than Cellulose, did not require any polishing of the top coat and was tough. They were susceptible to UV however, so could oxidise in bright sunlight. Not such an issue in Europe, but in California people would notice their red car turning pink. Therefore in the 1950’s Urethane Acrylics came along. These were highly durable and started to take over in manufacturing, though the refinishing industry held out with Cellulose well into the Seventies. Duotone paintjobs were popular, especially in the US, where the lower part of the sides of the car were a different colour to the rest, with a chrome or stainless divider. In the UK there was always a battle with corrosion as our climate is, of course, particularly suited to generating rust. 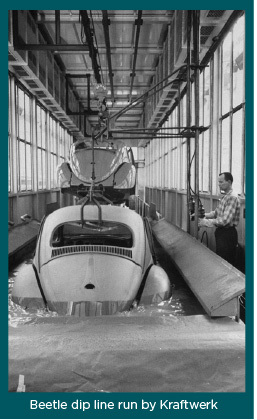 As unitary contruction methods became popular then so did dip processing of at least the bottom section of the bodyshell. When the then new MGB entered production, paint supplier ICI proposed a primer dip tank to fully coat the bare steel inside and out. The tank immersed the shells to the top of the bulkhead and they then climbed a ramp to drain the excess on their way to top coating. The shells had air bleed and paint drain holes to facilitate this. The upper/outer panels were then hand sprayed in the primer and it all went for top coating. The trouble was the top of the primer dip left a witness line where the paint reached to, so each shell required hand sanding to feather this out. ICI proposed deepening the tank to immerse the whole shell and remove this extra work. The management of ICI and MG proudly stood to observe the first shell going into the new, deeper, tank mounted on its line cradle. Now that the bonnet and boot was being immersed as well, it unfortunately meant that large air pockets formed under these panels and they were sufficient to lift the shell off its cradle. With a bubbling of primer as the air escaped, the shell descended slowly forward and down, like a submarine diving into the ocean depths. The attendant crowd awkwardly and near silently dispersed, leaving the men in brown overalls to work out how to raise the Titanic. The Urethanes required a catalyst to create the chemical reaction that cures the paint and the term ‘2K’ refers to these two parts which are mixed to initiate the curing reaction. Consider the growth in car ownership after World War 2 and you can see this was a technology the big chemical companies were happy to invest in. 2K evolved, improving steadily and going through several innovations as one manufacturer leapfrogged another. The 1960’s saw Ford (they do seem to pop up a lot in the paint story) introduce anodic electrodeposition on one of their US lines, which used an electric charge to attract the primer coat to the metal bodyshell to waste less material and provide better coating in internal recesses and on edges. In the 1970’s an improved process took this one step further. Cathodic electrodeposition primer dip, provided far more durability to rust. It was a revolution for the industry even though it was hidden under the colour coat and hardly noticed by the consumer. Anyone that says “They don’t make them like they used to” would be right, my Fathers bodyshop spent most of the 1970’s replacing cills, subframes and strut tops on cars that were only a few years old. Today even a ten year old car rarely has structural corrosion issues. When the massive new factory at Solihull was built for the upcoming Rover SD1, a new, advanced, paint plant was built with an electro dip primer process. Then a paint with ‘thermoplastic’ attributes was applied which was heated to a temperature where it reflowed, smoothing any imperfections. Those first cars were magnificently glossy and the paint was hard as nails, but after a few months flaws in the process began to appear. Moisture had become trapped under the paint and it began blistering in spots all over the shell. These pockets rusted ferociously so you ended up with a car that looked like it had an attack of metal measles. Having assisted in the respray of a Rover 3500 of the era I can testify to the weird nature of this ‘Pox’. When you started rubbing down these 2” bubbles of rust the paint would separate from the bodywork in the area around the blisters so you just ended up with an ever growing area of filling and painting. It was also during the 70’s that ‘Clear over Base’ gained major market share. This involves spraying the metallic colour coat first, which appears matt but assists in the even laying down of the aluminium, or later mica (especially for Pearlescent), flakes that provide the ‘metallic’ effect. A clear coat is then applied over the top to provide the gloss as well as UV protection. You occasionally see a car where the bond between these has failed and the gloss peeled off in patches, leaving matt areas. In the 1990’s even solid paints used a clear coat over them. The 2K paints contained Isocyanates and had dangerous respiratory repercussions if not used in the controlled environment of a spray booth with masks that had a clean air feed directly to the painter. At one point, the biggest group at risk of occupational Asthma in the UK was vehicle sprayers. Both for the individuals and the environment, water based paints have become the rule, the first plant going into Opel in Germany in the 1980’s. They’re not totally VOC free, they’re about 70% water (the carrier, replacing the bulk of the solvent) and 20% the solid paint pigments and 10% Solvents. Thats still a lot better than the 80% VOC’s and 20% pigments of the past. Chroma paint shifts colour depending on the angle of the light and the viewing point. The first Chroma painted production car was the 1995 Ford ‘Mystic’ Mustang in the US and it was then made available to boost lacklustre sales of the Ford Probe in Europe. The colours were rather wild, shifting from purple to green to gold. 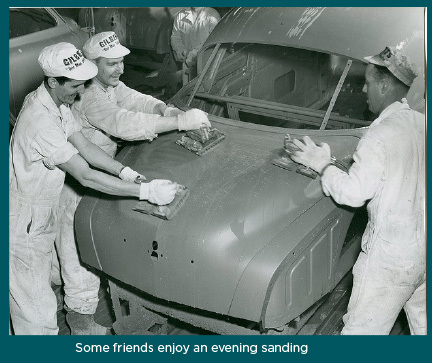 BASF developed the paint and Ford had the exclusive rights, of which they were very protective. The original paint was only available from Ford and there were stories of repair shops getting visits from the companies representatives to check on the subject vehicles damage, selling only the amount required (at around $1500 per gallon) and taking away any excess. Initially assumed to be Ford protecting their technology, there has been speculation that the secrecy was US Federal Government led as it was about to introduce currency which used anti-counterfeiting ‘optically variable ink’ with a similar effect to the Chroma paint. The theory is they were just trying to limit any means to replicate that affect and some weight to this argument was added later when the notorious American counterfeiter, Artorious Williams, used stamped ‘Chromaflair' (a similar paint released by a competitor) to produce his own US$100 bills in quantity. At the dawn of the new century powder coating was the cutting edge of finishes, requiring no solvents, the powder is attracted to the bodyshell by an electrical charge which minimises wastage. Several companies now use this for the application of primer coats but Akzo-Nobel developed a powder top coat. BASF on the other hand prefers a powder ‘slurry’ coating which involves applying the powder suspended in a water carrier and the water then being removed after deposition of the powder, which is heated to bake it. Mercedes pioneered this process on their ori ginal A Class. PPG developed a system called Flexcolour, where the core paint base colours are mixed at the spray head rather than prior to application. 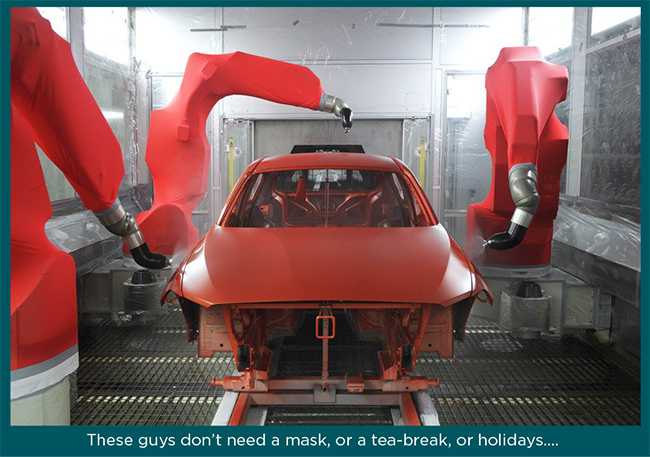 This allows colour change on the fly for every bodyshell that appears before the robots that now paint cars without any operator health risk. 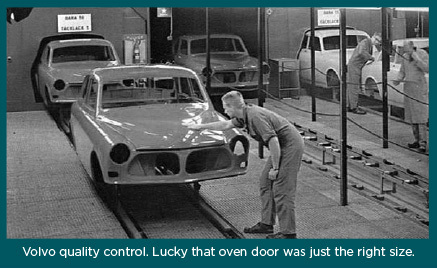 In the meantime, the old paint lines were being dismantled and in Detroit, the trolleys that carried the bodyshells through the spray booths for decades were scrapped. Recyclers discovered them to be covered in inch (or more) thick layers of different paint colours built up over the years and baked as hard as rock due to the continuous cycling. 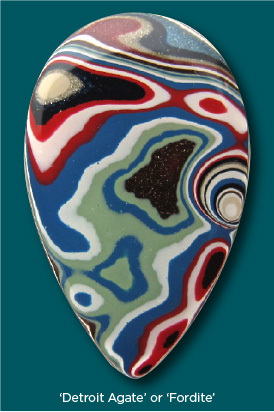 When cut and polished this was was made into jewellery under the nickname ‘Detroit Agate’ or ‘Fordite’. The source is now long gone so this may now be an unusual heirloom of the petrol age for the future. The story of vehicle paint is therefore one of continuous evolution and has varied not just from vehicle manufacturer to manufacturer but even model to model, being based on the plant where the car emerged from. So, at the risk of inducing a sweat in some restorers obsession, that painstaking nut and bolt restoration can’t actually be 100% perfect because it is unlikely you can replicate the actual paint or processes used on the car originally. Some of them just can’t be repeated and some are now even illegal. Copyright Clement and Boggis 2018. A NOTE ON IMAGES: We try to use our own images and those from reliable sources. If you see an image on our site for which you own the copyright please contact us immediately so that we can show full accreditation or, if required, remove. If you have an image that you believe would compliment a post and help make the point, please send it to our usual email address. Full accreditation will be given.